Joins (merges) iTunes tracks, with chapters. Is there a better alternative to Track Concatenator? Is Track Concatenator really the best app in Audio category? Will Track Concatenator work good on macOS 10.13.4? 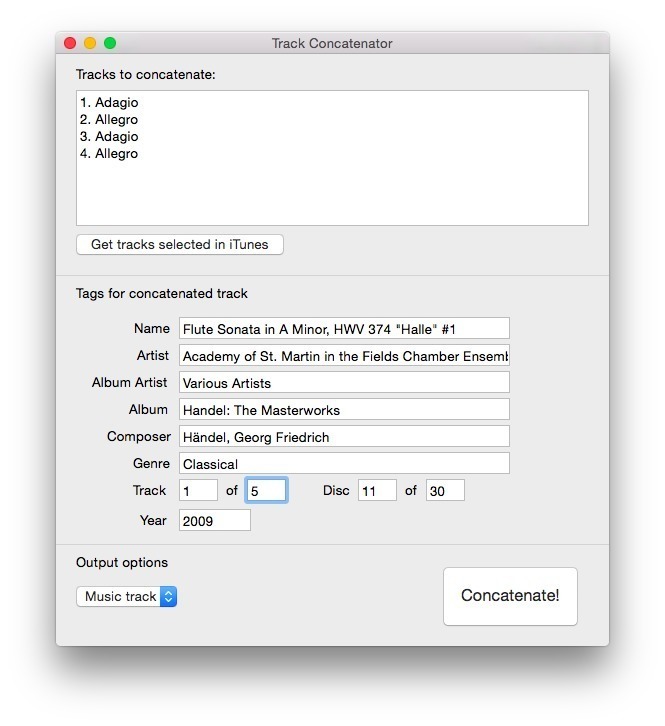 Track Concatenator joins iTunes tracks into single, chapterized MP4 files. Allows output as Music or Audiobook. Requires FFMPEG/MP4v2 (can be installed on first run). Joins MP4/AAC files losslessly without reencoding; joins other filetypes (or mixtures of filetypes) with reencoding to MP4/AAC at the highest bitrate of the input files. See demo video: How to merge tracks in iTunes. New sandboxing features in Mojave would silently block connection to iTunes and Terminal. The app can now ask for permission for these capabilities. Join for non-AAC audio files had been broken due to mis-specified paths. Weird layout problems in newer macOS versions have been fixed. Track Concatenator needs a review. Be the first to review this app and get the discussion started! Track Concatenator needs a rating. Be the first to rate this app and get the discussion started!